That slide claims to be quoting a speech by Chinese government official Li Runsen, who was stating Chinese government goals. Since this presentation was leaked, Cisco has denied that the company shared those goals. Still, it makes them look pretty bad, as this slide clearly implies that the anti-FLG crackdown is an opportunity for Cisco. Now, it's important to note that contrary to what WIRED says, Golden Shield does not actually equal China's Internet censorship system known as the "Great Firewall" - the Golden Shield is actually a much broader program that includes many other things like law enforcement's internal communications and data managements systems. Mechanisms to censor and monitor the public Internet are just one part of it. From reading through the whole presentation, it seems to me that the presentation is more about assisting law enforcement communications and operations than about censorship of the public Internet in China; while one can certainly infer that such activities would be included, they are not explicitly stated. I also have some more background about the Cisco case which may be useful: The leaked powerpoint presentation was made in 2002, the same year that businessman Ethan Gutmann, author of Losing the New China: A Story of American Commerce, Desire, and Betrayal, visited a public security technology trade fair and picked up a Cisco pamphlet in which it specifically marketed its communication technologies with the aim to sell more equipment to provincial and municipal public security bureaus. (Note: the focus was on devices for police communications, not routers for public Internet networks). Gutmann also wrote in his book about a conversation he had with a Cisco employee who boasted about a router custom-made for Chinese Internet censorship. In 2005 at the time of the first shareholder resolution by Boston Common Asset Management and Domini Social Investments against Cisco, I republished the relevant book excerpt by Gutmann as well as images of the Cisco pamphlet obtained by Gutmann. You can read that post here. That post sufficiently rattled Cisco that I was contacted by Cisco spokesman Terry Alberstein (who is also quoted in the Wired article). Alberstein insisted Cisco had done nothing against U.S. law, that it had done nothing more than what it does when marketing its products to police forces all around the world, and that Cisco had never customized any router specifically for Chinese internet censorship. He was evasive on the question of whether Cisco employees had ever provided installation/configuration/follow-up service specifically intended to help customers configure their routers for censorship purposes. My blog post summarizing that conversation is here. The story got some press, but didn't ever get big traction in the mainstream media, though I personally know a couple China-based reporters for major news organizations who sniffed around to try and confirm Gutman's story. But they never found enough of a "smoking gun" to convince their editors that they had something to nail Cisco with. To many reporters who cover China, this debate is reminiscent of the debate in the 90s about dual-use export controls on computers that could be used either to save lives in hospitals or to launch ICBM's... eventually the free-traders won out (with heavy lobbying by the American Chamber of Commerce) because they argued that if IBM didn't sell the computers, then the Japanese or Germans or somebody else would anyway, China's behavior or capabilities would be no different but Americans would have lost the business. I find the Cisco case much tougher to argue than the Yahoo case or even Google or Microsoft: At least in those cases the facts of what employees of these companies did and didn't do, under what circumstances, and with what direct consequences for whom, were either clear from the beginning or could be sleuthed out. With Cisco, cold hard proof of exactly what Cisco employees did or didn't do - and what their intentions were - remains elusive. We know that their routers have been used for censorship. Nobody has yet come up with "smoking gun" evidence to back up Gutmann's account that Cisco was selling a special censorship router. Cisco has done a great job at preventing anybody from obtaining any evidence that can't be denied or discounted in some way. This new powerpoint adds a strong data point that makes Cisco's intentions look really bad. It takes us closer but it doesn't take us all the way there. 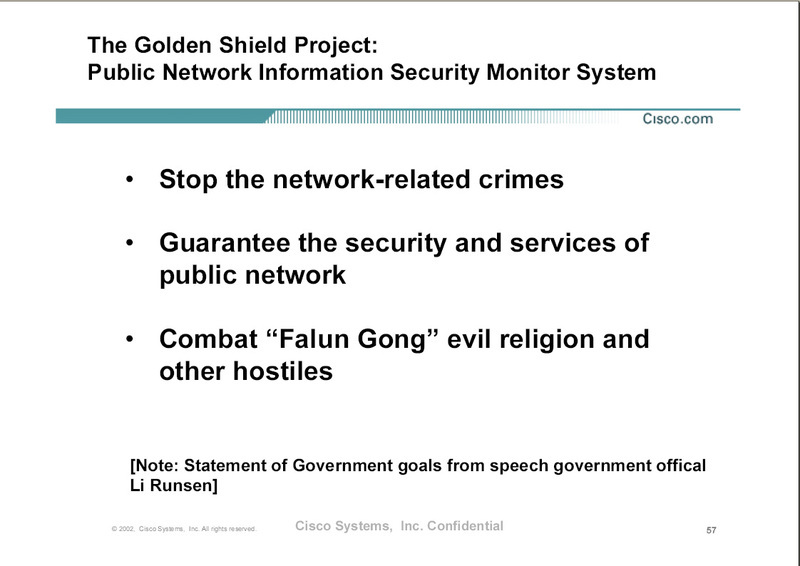 Whatever the truth is, Cisco has not been transparent and forthcoming with the public about their activities in China. And they've failed to engage in the ongoing effort to set human rights standards for Internet and telecoms companies - as Microsoft, Google, and Yahoo among others have done. WIRED quotes Arvind Ganesan of Human Rights Watch calling for Cisco to conduct a human rights review of all its activities globally. Others have pointed out that the Cisco situation highlights why Internet and telecoms companies need formal, transparent, and verifiable systems to guide their behavior so that they don't end up being complicit in human rights abuses even if that's not what they intended. The problem is, of course, that if Cisco and other companies cited in Naomi Klein's recent Rolling Stone article stopped selling to all police forces in all countries where Human Rights Watch, Amnesty International, and others have cited repeated, serious police violations of human rights, they wouldn't have much business. This is an argument some people in that industry have made to me privately. Are the Chinese police, they ask, really so different from a lot of other police forces? Other than the fact that they operate in a country led by a regime that runs economic policies more capitalist than most EU member nations, but which still calls itself Communist? At the end of the day, though, Cisco has done a lousy job at explaining itself. We are left with many question marks. Their behavior and statements to date have given us little reason to believe that they care in any meaningful way about human rights. We'll be able to fix this when either we, or they themselves, hold each individual Cisco employee responsible, not some abstract corporate policy. "Cisco" didn't perform any acts - "Cisco" is an idea, and a legal construct. Actual human beings with identities and legal responsibilities spoke the words, wrote the documents, signed the contracts, programmed the firmware. If they represented official company policy, then EVERY Cisco employee must be held responsible for helping to execute that policy. but I don't think anyone is going to believe this was a couple of rogue bad apples, even though this is the most likely outcome should it ever get to court. If the word "freedom" has any meaning worth preserving, it is the right to make one's living without being compelled to do or support evil. This - like everything about freedom - requires constant defending. Or is it perhaps "free dumb" that Americans are so enamored of? re: This is an argument some people in that industry have made to me privately. Are the Chinese police, they ask, really so different from a lot of other police forces? umm, I think the correct answer is SO WHAT? Are you really suggesting that is a valid moral criteria to make that decision with? Or just that it should override ones, or one's countrys, morals?